With mega superstars like Janet Jackson proudly sporting the Sankofa design, it's easy to see why this unique image is a favourite in the tattoo world. The Sankofa is not an actual creature. Like the Griffin or the Unicorn, its origin is shrouded in mythology and mysticism. The image has deep spiritual meaning in the African-American community and hails from the Akan people of West Africa, namely Ghana. It is a favourite for clothing and jewelry designers, as well as for tattoo lovers who want something outside the ordinary. The Sankofa is one symbol in a collection symbols known as the Adinkera. According to Akan tradition, Adinkera symbols date back to the early 1800s, to a time shortly after the Ashanti-Gyaaman war. The Sankofa design features a beautiful bird looking behind while picking an egg off its back and is believed to come from an Akan proverb that means "go back and fetch it." The design has meaning for anyone who has had a difficult past and who wishes to move on to a brighter future. The design hints to the concept that one can always learn from one's past. It calls upon wearers to pick up the traits and lessons from their past that were good and meaningful (hence the bird looking backwards) and bring these eggs of goodness to the present. By looking to the good things of the past for inspiration and applying them to your present situation, you can make a bright future (as represented by the egg) for yourself. The Sankofa is also a symbol of love because the design rests on the notion that a mother bird is caring for her young (her egg). 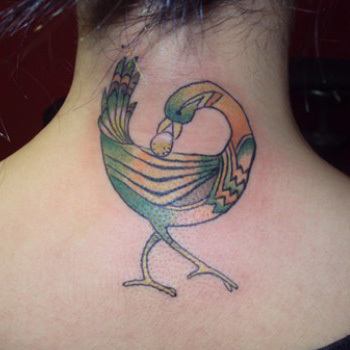 Sankofa Tattoos usually come as tribal designs, but there are pieces in which the bird has plumage even more beautiful and vibrantly colorful than a peacock. As a play on its connection with love and matters of the heart, the Sankofa can also be represented as a stylized heart. The Sankofa is one of those symbols that have worldwide appeal and spiritual meaning regardless of your cultural heritage. The ability and desire to learn from your mistakes in order to make a brighter future for you and your family is universally human and designs like these are great reminders that we are all connected in life. Adapting a Sankofa Tattoo to reflect your distinct style can be a daunting task, but the team at www.itattoodesigns.com can help you create a truly unique piece that speaks volumes. Visit our design page and take advantage of our Custom Tattoo Service.